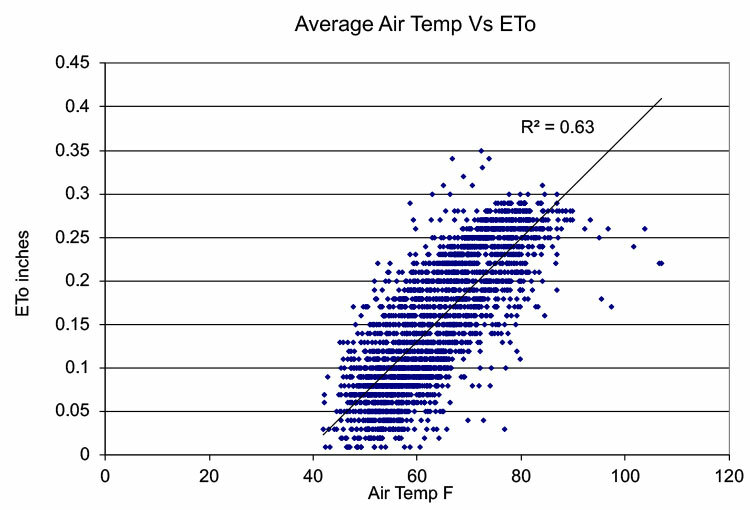 This graph illustrates the general relationship between average air temperature and reference evapotranspiration (ETo) recorded at CIMIS weather stations. The correlation is not fantastic, but it demonstrates the important relationship between increasing air temperature and increasing evapotranspiration. Once air temperatures drop below 50 F (10 C), evapotranspiration slows and uptake of nutrients from the soil solution tapers off. There is no reason for heavy fall fertilization when average air temperature drops below 50 F or a growth potential of about 20%.